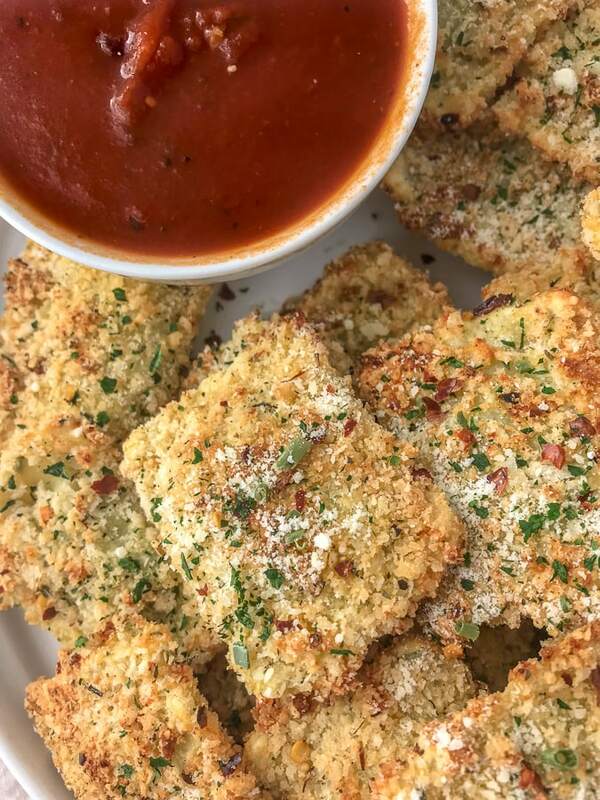 Baked Parmesan Crusted Ravioli Bites – Ravioli that is not only super crispy on the outside, but cheesy on the inside. Perfect party snack for your game-day gatherings, parties, girlfriends night, or movie night with your family! Enjoy the traditional Fried Ravioli, but without the guilt! 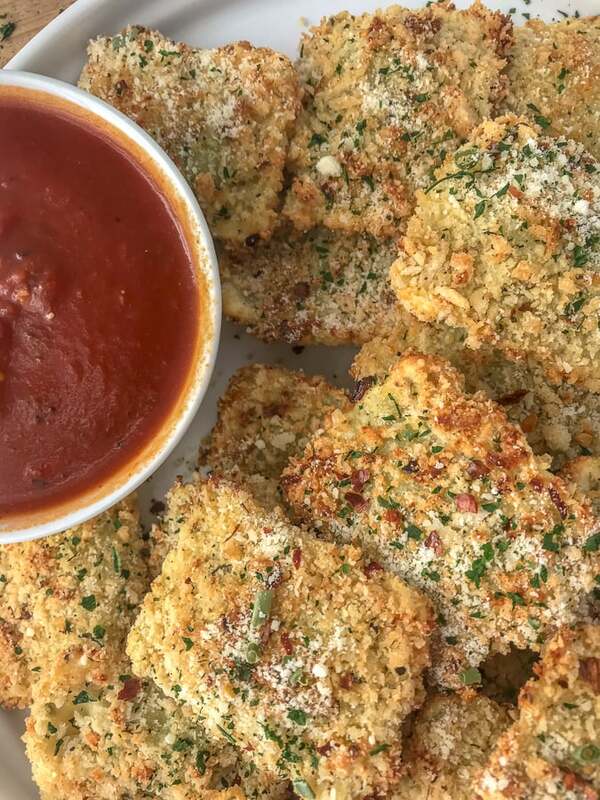 These Baked Parmesan Crusted Ravioli Bites are so easy to make, take little work to prep, and use just a handful of ingredients that you more than likely have in your kitchen already! Minus the ravioli that is. 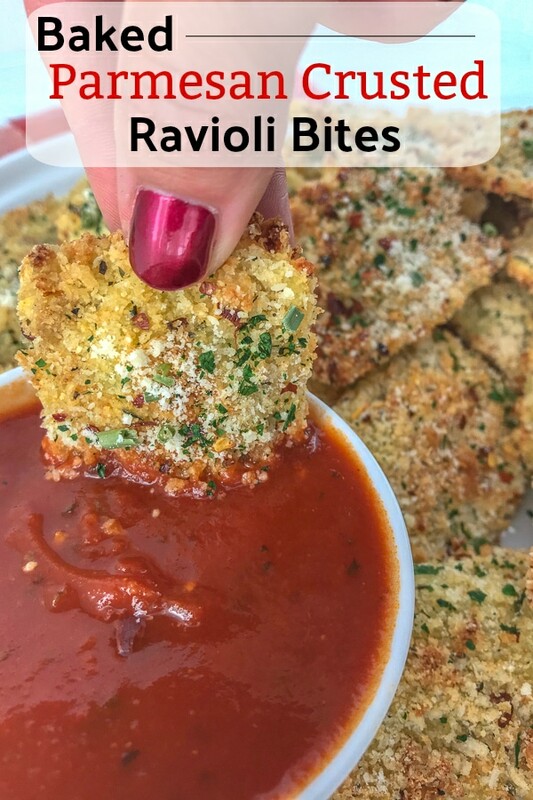 These ravioli bites are easier to make than one would think. 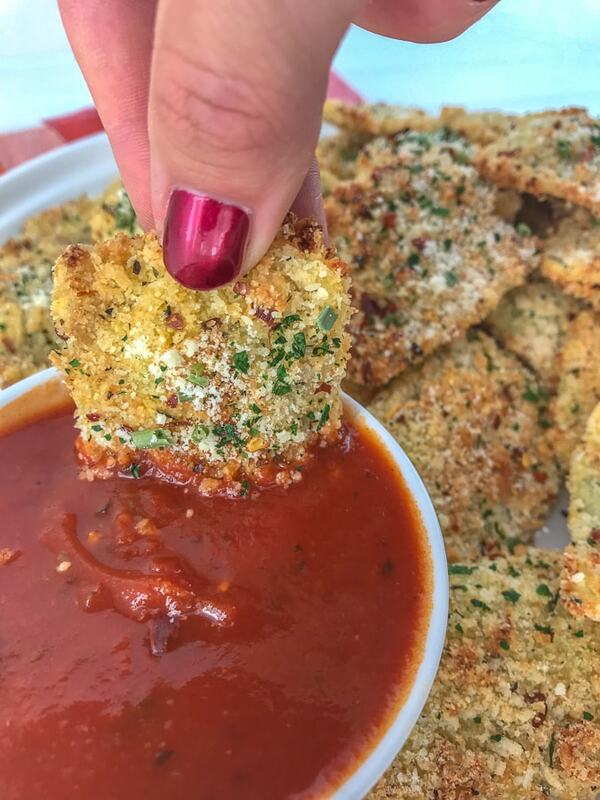 If you can make homemade chicken fingers or nuggets – you can make these Baked Parmesan Crusted Ravioli Bites. That is how simple it is! And simple is always a wonderful thing when life gets hectic. I am all about simplicity. 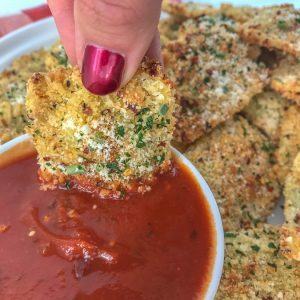 This delicious game-day appetizer starts with cheese ravioli that is dredged and coated in seasoned breadcrumbs. Once fully coated, they are then baked in the oven until they are a crispy, golden brown on the outside. Doesn’t get much easier than that, now does it? You can swap the cheese ravioli for meat-filled ravioli or the pre-made ravioli of your choosing. Or even swap these out for tortellini. If you do not have panko breadcrumbs or would rather not use flour, you can opt for coating in regular or seasoned breadcrumbs. If you use seasoned breadcrumbs, omit the italian seasoning and garlic powder (unless you’re a garlic lover). I use refrigerated ravioli, but frozen will work, too. Just make sure they are fully thawed prior to using. 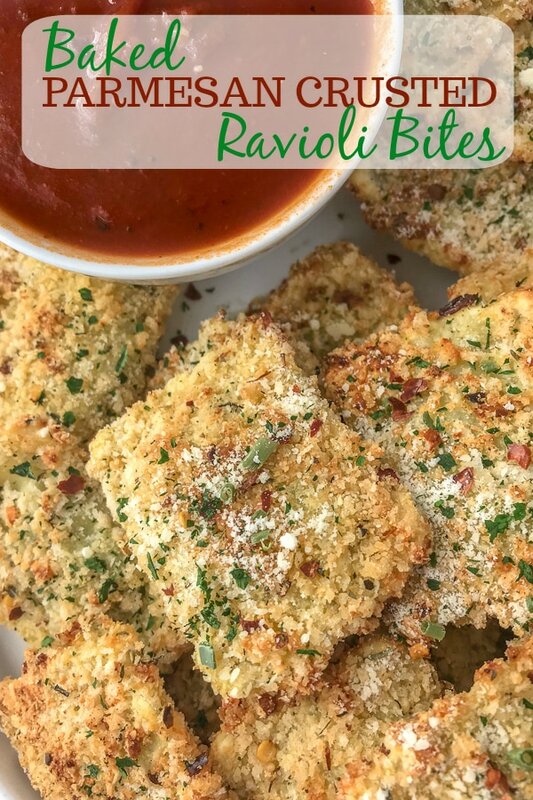 Marinara makes for the best dipping sauce with these ravioli bites, but I can also say that Alfredo sauce or pizza sauce work just as deliciously! Looking to freeze leftovers? Simply freeze the bites in a single layer on a cookie sheet until frozen. Then transfer to a freezer-safe bag and place back into the freezer. Be sure to use within the week. *See recommendation below in the ‘Tools Used‘ section for what I do and use to freeze these! You can pan fry these if you would prefer. I don’t think anyone would object! 😉 Simply skip the boiling step and add enough oil to cover the bottom of a deep pot. Once heated to approximately 350 degrees F, fry each breaded ravioli 1-2 minutes per side, or until they are a crispy, golden brown on the outside. Wilton Non-Stick Cookie Pan – if making the entire batch, I recommend two large pans. Reynolds Cookie Baking Sheets – great parchment paper baking sheets that you can pull straight from the box, without worrying about measuring or cutting. Vacuum Sealer by NutriChef – I use this machine with the bags to vacuum seal and freeze my foods over freezer bags. Food stays fresher longer in the freezer! 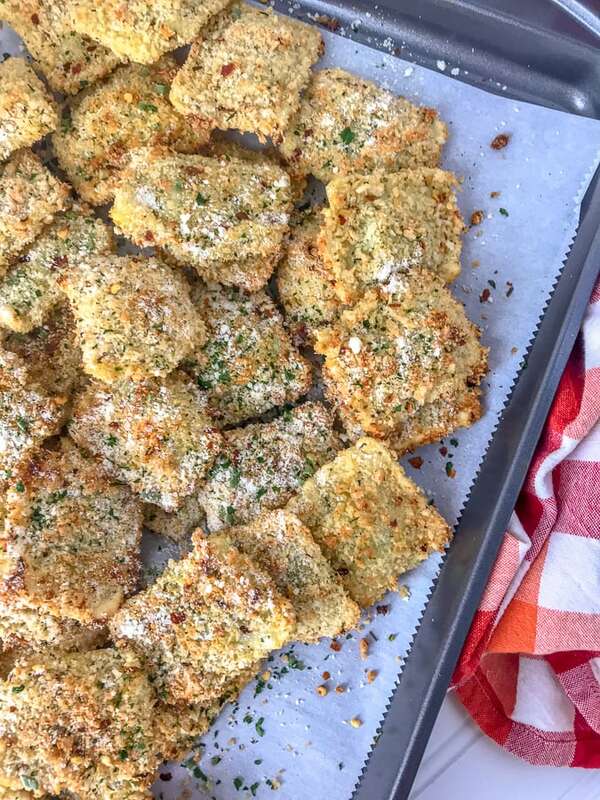 Baked Parmesan Crusted Ravioli Bites - the perfect game-day gathering or movie night finger food that your friends and family will love! Easy to make with a handful of ingredients guaranteed to already be in your kitchen! Boil the ravioli al dente according to the directions on the package. Be sure not to overcook, otherwise you will have mushy ravioli! Transfer to a strainer and rinse well under cold water. Bowl 1: Add the eggs and whisk. Bowl 3: Combine the remaining ingredients; panko breadcrumbs, parmesan cheese, and seasonings. Mix well. Starting with bowl one and working your way to bowl three, coat each ravioli in flour, dredge through eggs making sure to allow any excess to drip off, and then coat each piece generously in the breadcrumb mixture. Place each ravioli onto the baking sheet making sure to leave a bit of room in between each one to allow even baking. Bake 12-13 minutes, turn, and bake for a 2-3 additional minutes. Or until the outside of the ravioli has reached a perfect, golden and crispy exterior. Remove and serve garnished with additional parmesan cheese, freshly chopped parsley, and red pepper flakes. Best served right away with marinara. You can pan fry these if you would prefer. I don't think anyone would object! 😉 Simply skip the boiling step and add enough oil to cover the bottom of a deep pot. Once heated to approximately 350 degrees F, fry each breaded ravioli 1-2 minutes per side, or until they are a crispy, golden brown on the outside. 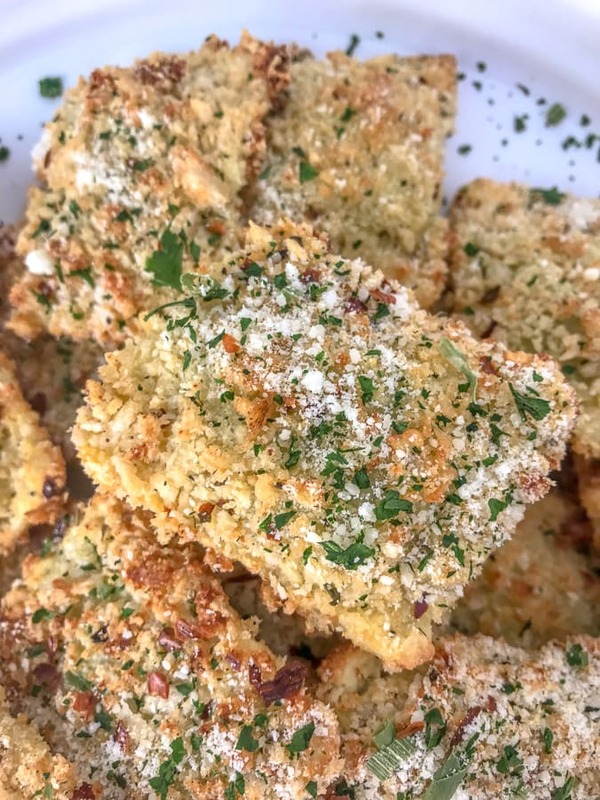 If you do not have panko breadcrumbs or would rather not use flour, you can opt for coating in regular or seasoned breadcrumbs. If you use seasoned breadcrumbs, omit the italian seasoning and garlic powder (unless you're a garlic lover). I use refrigerated ravioli, but frozen will work, too. Just make sure they are fully thawed prior to coating. Number of ravioli's per package can vary, so nutrition is based on 8 ravioli's per serving. Do these reheat Well? They sound like a great lunch meal prep! Yes, they can be reheated. But I would recommend baking them, rather than reheating them in the microwave. What temp do you cook the raviolis at in the oven? Recipe does not say. Not sure how I missed that!! Thank you, just added it to the instructions. Temperature is 400 degrees F.